ELIGIBILITY for concession fares on public transport should be drastically restricted or available only during off-peak times, to improve the profitability of trains, trams and buses, according to an influential transport lobby group - whose members include the Brumby government. In a report to be launched today, Meeting the Funding Challenges of Public Transport, advocacy group the Tourism and Transport Forum proposes six ways to increase revenue and cut the costs of running public transport. The report concludes that the ''most prospective'' way to help public transport operators raise revenue is to cut the number of people eligible for concession fares. This would make public transport more financially sustainable, by helping pay for improvements to services, according to the group, whose members include transport operators across Australia. The state government is also a member of the Tourism and Transport Forum, and Public Transport Minister Martin Pakula will be at the launch of the report today. But his spokesman said the minister had no plans to reduce the availability of concession fares across Victoria. Melbourne and Sydney have Australia's highest public transport fares. The report argues that Australian cities, and Melbourne and Sydney in particular where 23 per cent of all fares are concession, offer ''comparatively generous concession allowances''. - Slashing the types of concession discounts available. - Cutting the amount of money saved by concession fares. - Tightening the eligibility criteria. - Making concession fares valid only during off-peak times, to encourage people using concession tickets to travel when trains, trams and buses are less crowded. Victorian Council of Social Services chief executive Cath Smith said trains and trams in Melbourne were already so crowded that people on low incomes or pensioners already travelled at off-peak times if they could. 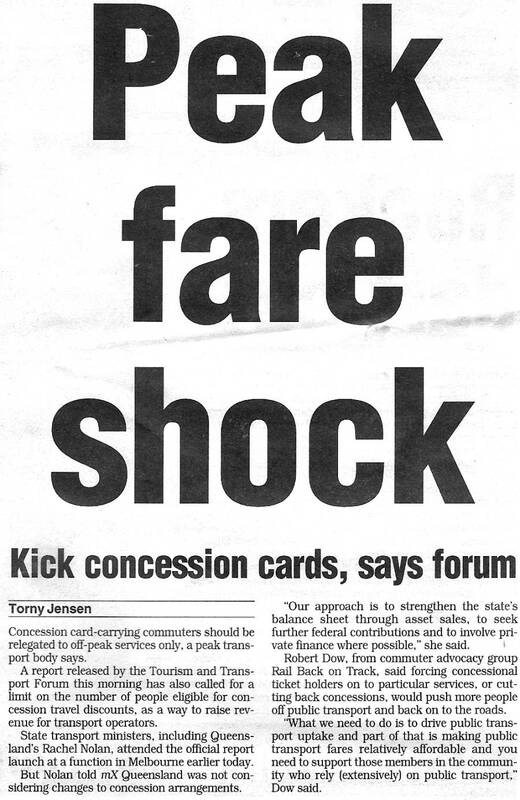 Removing concession fares at peak times would disadvantage those that couldn't afford it, she said. A two-hour, zone one ticket in Melbourne costs $3.70 and a concession fare $2.30, while zone one-and-two tickets cost $5.80 and $3.30. The report predicts the number of people eligible for concession fares will rise dramatically in the years ahead, as Australia's population ages - but that not all will be deserving of cheaper fares. Meanwhile, some full price passengers who are in employment - such as low-income workers with dependants - are still struggling to break even, it says. Slashing the availability of concession fares would increase revenue for transport operators across Australia by $100 million a year, the report says. The report concedes that slashing access to concession fares would disadvantage the poor, who would travel less as a result. In 2008 the government capped fares until next December. PEAK-hour commuters should pay more to help finance billions of dollars worth of transport projects, an industry group says. The Tourism and Transport Forum said the eligibility for concession fares should be tightened. In a report out today, it says fares don't come close to paying for public transport. "With pressure for increased public transport services ... it is imperative governments look to innovative ways to make and save money," said TTF's managing director, Christopher Brown. A report for the TTF, by LEK Consulting, said new ways of making money needed to be considered to bankroll major projects. The TTF is a lobby group whose members include Metlink, the City of Melbourne and VicRoads. Higher peak fares would also encourage more off-peak travel. "Implementation of fare increase strategies during the peak requires political will and may need to be phased in over time," the report said. The myki smartcard could be used to introduce different fares depending on time of day and where travelled. "Australian cities have relatively broad and generous concession policies when compared with major US and Asian cities," the report says. "There may be scope to reduce concession discounts ... concessions could be determined according to need, as is their original purpose. "It is important to reassess the discounts that are being offered, and to whom, to ensure that discounts are being received by those who really need them." The State Government has said fares would be raised to pay for new projects such as the first stage of the rail tunnel from Footscray to Domain. Fares will go up by more than inflation in 2012 and in 2013. Public Transport Users Association president Daniel Bowen said fare increases could send people back into their cars. "Melbourne's public transport fares are already some of the highest in Australia," he said. The more PT people use, the more viable it becomes. RAIL Back On Track (http://backontrack.org) a web based community support group for rail and public transport and an advocate for public transport commuters has said the suggestion by the Tourism and Transport Forum (1) to restrict concession travel on public transport for the most disadvantaged is seriously flawed. "The direct cost subsidies for public transport may be in the order of five billion dollars annually, but this actually saves our community considerable expense when real costs of flawed car centric transport systems are properly considered." "The cost of road trauma is in the order of forty billion dollars annually (2), coupled with congestion costs of around ten billion dollars annually and environmental costs yet unquantified, we should be encouraging more public transport investment and uptake rather than restricting the opportunities for public transport uptake and punishing the most disadvantaged in our communities. Governments should be moving to encourage public transport uptake not restricting travel opportunities." "We do agree with the Tourism and Transport Forum about the need to drive higher uptake of off peak public transport travel though. This can be achieved by ensuring proper off peak frequency and fare incentives to do that. Far better to have a train with only 100 passengers enjoying a 10% off peak to be actually carrying 400 passengers enjoying a 30% off peak discount. This not only increases the fare-box it actually is a multiplier for more economic benefit when all factors are properly considered. It is a no-brainer!" I think I remember a time when you couldn't buy a concession ticket on certain peak bus services in Brisbane. If you already had a concession daily or a concession 10 trip saver you could use it but if you needed to buy a ticket from the driver it had to be a full adult fare. Am I imagining it? It would have been around 2003-2004 before integrated ticketing came in. I remember that too! Yes, it is true! You couldn't buy a concession, you had to have a pre-paid one already or pay full fare. Some places have surcharges for express buses. But that falls equally on everyone. raise revenue is to cut the number of people eligible for concession fares. No estimation of the revenues generated appear to be given. This might be just a lack of detail. What is their fare-box ratio like? for improvements to services, according to the group, whose members include transport operators across Australia. While the TTF claims that this move will make transport more "financially sustainable"
Optimising one objective may come at the cost of another. and environmental sustainability (people may decide that it is cheaper to drive). Of course it all depends on the level. Without more cash, more services can't be put on. for a better service, they won't pay if they just get the same service but just with a higher fare. So just how high are they thinking of raising the fares? transport lobby group - whose members include the Brumby government. Seriously, is this code for "increase our subsidies/cash we are getting" because it sounds like it. Better to have peak/off peak fares. of it? What are the arrangements there? are all travelling to the CBD and racking up huge bus-km. (This seems more of a problem in Brisbane than Melbourne). so that fixed costs are diluted, using larger vehicles so that economies of scale can be realised.